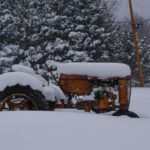 The old tractor managed to stay just above the snow line last week. The warm rusty machinery seemed to play well against the cold fresh powdery snow. I don’t know if the old girl starts, but she still cuts a fine figure. Wow. It’s been exactly four years and 251 paintings since we launched A Day in Vermont. Thank you for starting my day off with beauty. Happy Anniversary Peter! Thank you for this very special connection to my second home. 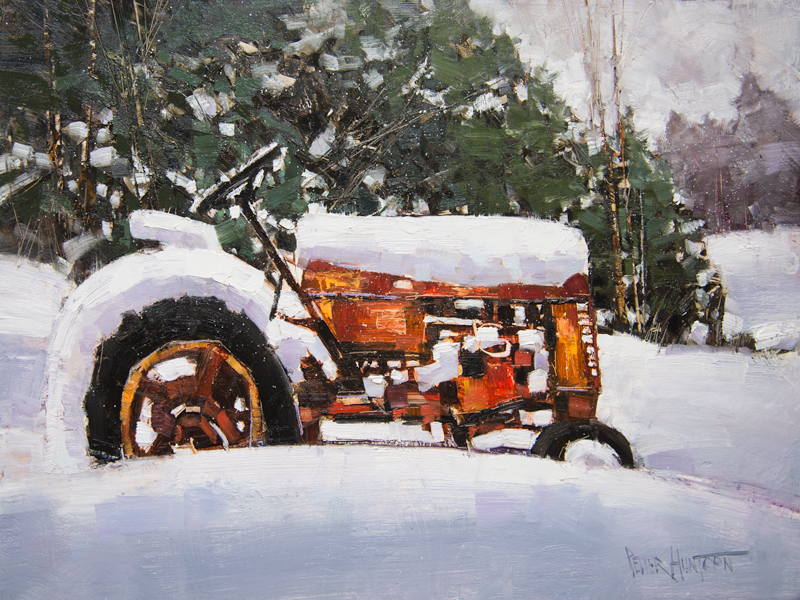 The tractor reminds me of another dear friend who lives in VT.
You’re a painter and a poet! Thank you for sharing! Congrats on the success of “A Day in Vermont”. It is always inspiring for me. I am currently in warm weather so the contrast with a snow covered tractor is a treat. Thank you! Looks like stella hit the old Farmall hard.Great picture! Congratulations, Peter, on another success story! 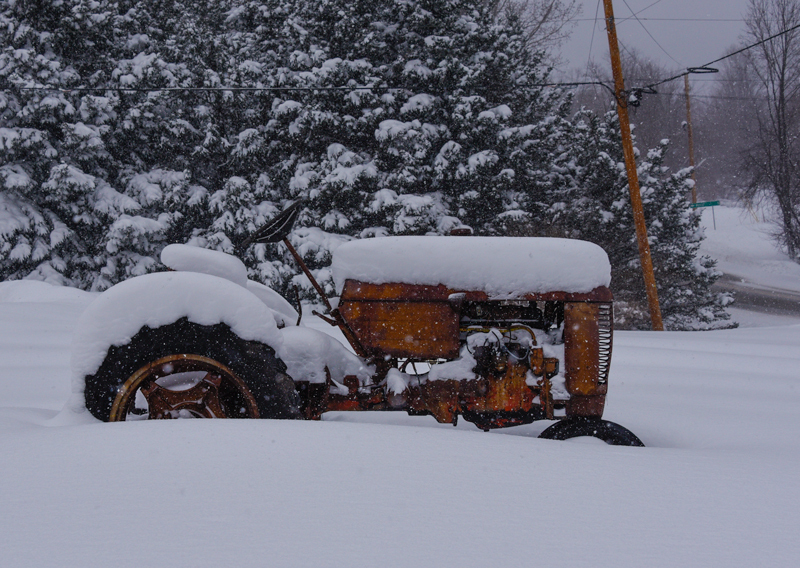 Love the tractor, tho lonely in the midst of the beautiful snow fall….still appears “ready to go”! Love old tractors! I expect there’s a lot more “spark” to this painting than there is to the plugs in the engine . Nice color scheme and interesting positive and negative shapes in this weeks rendition. Nice painting! Congratulations on 4 yrs of A Day In Vermont! We all enjoy it so. Peter, congratulations on your 4 year anniversary. Your paintings alway bring peace and contentment. Many happy returns, Peter! I enjoy comparing the paintings to the photos, to learn the way it really should look! Keep up your great work…you are a very talented gifted artist. And and we are grateful for dedication to the beautiful state of Vermont!! Wishing you a VERY Happy Anniversary Peter! What a wonderful painting of winter’s last (?) fury and the tractor out standing in her field! Our neighbour had once a fire spitting tractor, a “Lanz Bulldog”. It was a great action to start this monster. It made “puff” and “peng” and no wheel was spinning around. For us children it was more interesting as a TV-Show. We always hoped the old “Bulldog” would move. But there was no chance. Beautiful tractor. Michael Garland, a children’s author and illustrator, wrote a book about an old tractor called Grandpa’s Tractor. This painting reminded me of the book. Congratulations on 4 years, and looking forward to many more of them. Four years! Wow! Congratulations! She surely does cut a fine picture and thank you. As long time summer residents of Vermont we love this year round connection. As we sit in 80 degree temps in Texas your detailed water colors during any season fill our hearts. See you soon!! Love the painting, Love the concept’s.. Love! Love! Love! Love is all we need>>>….Beatles. Proud to know as my friend and fellow artist .. Congrats for all your tremendous ART and culture you bring to the great State of Vermont Peter……… Your fellow Winter camper and friend,, Rick Stott.